The Brooklyn Dodgers were formed from the inactive Dayton Triangles franchise July, 1930. 9/24   L   0-12   at Portsmouth Spartans (night) 16,500  9/25? 10/5   W  21-0    at Staten Island Stapletons   20-0? Last expansion team to have winning record in first season of play. 9/21   W  23-6    at Pick & Pat Club of Bayside, Auburndale Field, 192nd Street (night) (non-lg.) [Pre-Season]   23-0? 10/23  L   0-28   at Detroit Lions, at University of Detroit Stadium   (night)  11,000  10/22? 10/5   W  48-12  at Wilmington Clippers, Pennsy Field (night) (non lg.) [Exhibition Game] 10/4? 9/27   W  24-13  at Philadelphia Eagles, Shibe Park  (night) 16,341  Eagles protest for replay due to too many penalties. Denied. The Brooklyn Dodgers were renamed the Brooklyn Tigers for the 1944 season. 1944 2-12-0  (0-10-0 NFL, 5th Eastern Division) Coach: Pete Cawthon to 10/31; Ed Kubale and Frank Bridges after. Following the 1944 season, the Brooklyn Dodgers folded, the players going to the Boston Yanks franchise, playing in 1945 nominally as the Brooklyn-Boston Yanks, though this name was only used for their only New York home game. 11/9   L  12-13  at Cleveland Browns, Municipal Stadium  30,279  [Dodgers miss 2 extra points, 3 FGs, Cleveland's Groza misses extra point. 9/15   W  56-7   at Long Island Stapletons, Freeport Municipal Stadium  (night) (non lg.) [Exhibition Game] maybe at Cedarhurst Stadium? 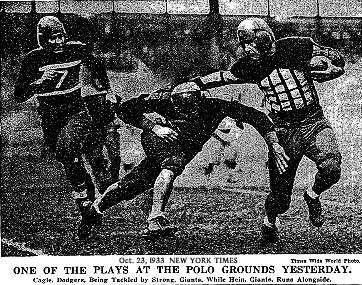 The first negotiations for a merger between the All America Football Conference and the National Football League called for the merger of the NFL Boston Yanks and the AAFC New York Yankees, to play at Yankee Stadium for 1949. As part of the agreement, the AAFC Brooklyn Dodgers would be eliminated. This deal was rejected by the A.A.F.C. In January, 1949, the Brooklyn Dodgers folded,  merging with the New York Yankees, the new team to play at Yankee Stadium. Some Dodgers players given to Chicago Rockets who become the Chicago Hornets. The Brooklyn Giants (Brivkley's Giants) played at Ebbets Field in 1921. The Brooklyn Lions (Brooklions) & Brooklyn Horse-Lions played at Ebbets in 1926. The Brooklyn Tigers #1 played AFL (#2) home games at Ebbets Field in 1936. The Brooklyn Eagles of the minor league American Association played at Ebbets, 1937 & '38. Also see All College (and high amateur) football games at Yankee Stadium! This list compiled and designed by P.S. Luchter.